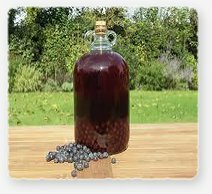 Sloe gin is a red liqueur made with gin and sloe (blackthorn) drupes, which are a small fruit related to the plum. Sloe gin has an alcohol content around 27.5% percent by volume. 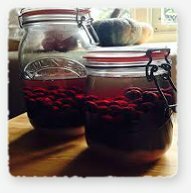 The traditional way of making sloe gin is to soak the sloes in gin, as an alternative you can use whiskey or vodka instead. We pick our sloes from local hedgerows far away from any road or built up areas.